Lessons We All Could Learn From Coffee! By my own admission I am not a Starbucks fan. I usually prefer the funky, fair-trade coffee shop to the large chain. 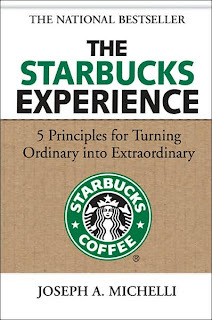 This book The Starbucks Experience, though, has really opened my eyes to the total package of a large corporation Starbucks represents. The more I read this text, authored by Joseph A. Michelli, the more passionate I become about the importance of this book, both in my work at Lake Junaluska, but also about how the Church works to connect with those normally outside of its bounds. This book is a word in due season, not only for businesses struggling to understand the “experience economy” but also for those seeking to build bridges to the postmodern world. While I wont’ go into detail about each of these, I will say a word about “Everything Matters.” This principle is the most forgotten, both in ministry and in business. We forget that it is the details that make the difference. That both success and death are in the details. In the book, and on Michelli’s podcast, he talks about the decision to continue using two-ply toilet paper rather than saving thousands of dollars by switching to one-ply. Starbucks understands that every moment of the experience, even the one’s most overlooked by the business, make an impression. This chapter reminds me of another blog I wrote a couple of years back about what I learned from Walt Disney World. How they manage every moment of your experience, down to the moments you spend in line waiting. They have understood these five principles longer than anyone! Where else can waiting be part of the adventure? Thanks for the insight. I will need to find this book and read it. God bless you.